One of the most frequently asked questions kids ask me is "how do you backflip?" This question can get on the nerves of many pro riders. If you really want to learn to backflip, I'm going to verbal teach you as best I can. Keep in mind there are also a ton of videos on Youtube that you may find helpful! There are a few things you need to be able to do before you try and backflip. You should definitely only attempt a backflip on a pro scooter and not on a toy. You should be able to drop in and carve around bowls with ease. Also you should be able to flow around the park without getting speed wobbles. The next thing you should be able to do is backflip on a trampoline. Being able to flip on a trampoline will help you when you finally go and try it on your scooter. The best place to learn how to backflip, is hands down a foam pit. It doesn't matter if you land on your neck or your back, you're not getting hurt. Get a feel for the foam pit and the take off. What you need to do in order to flip is simple; lean back with your body and head. That's honestly all there is to it at first. Once you get better you can tuck your knees and get them to look cleaner. Right as you start to feel your front wheel pull off the ramp, just lean back and your body will flip. Don't pull back too early otherwise you could scrape your head on the top of the ramp (this barely ever happens though so dont worry about it happening to you). Also make sure you commit! It may not feel like you're not rotating, but bailing while halfway through a flip is never a good thing. Once you have them done them into a foam pit just play around with them and get them dialed. You're now ready to take them to resi/wood/concrete. Imagine the ground you are back flipping onto is just like the foam pit. You now have the muscle memory of how to backflip. As long as you commit to it and want to do it, you will land it. Like I said earlier though, I highly recommend you wear a helmet and pads. You don't want to be landing on your head without a helmet on. Once you man up and huck it to concrete/wood you've officially landed a backflip! Play around with them until you get them 100% dialed. Flip out of smaller things and bigger things, mellower things and steeper things. 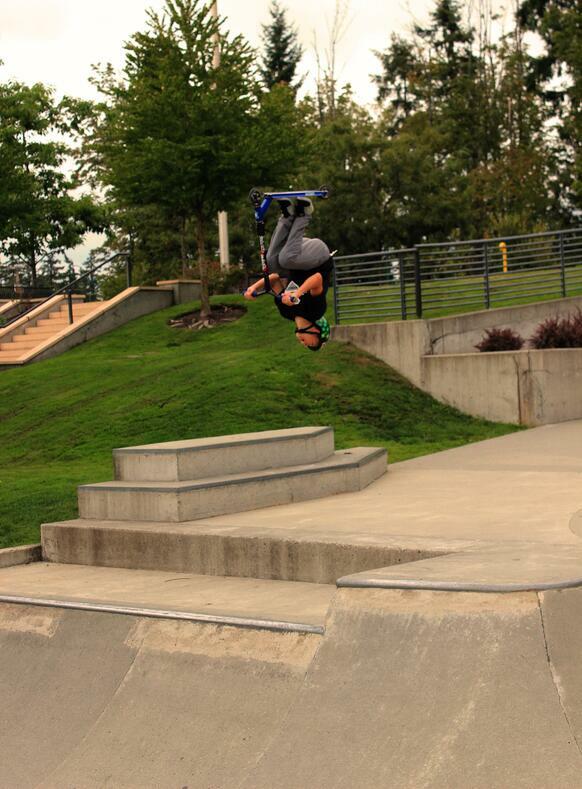 Once you get backflips good you can start to add tricks to them such as backflip whip, backflip tuck, etc. I hope this helped you progress and try backflips soon. If you cannot get to a foam pit just bring a mattress to your local park and huck haha. If you are just going to attempt it right away to a mattress or straight concrete, I would highly recommend you know how to backflip on a trampoline. The last thing you want to do is bail on concrete. The biggest thing while flipping is just to commit. If you commit, you will rotate it.